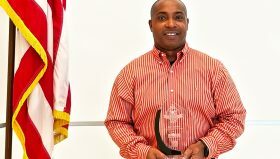 Sean Sanders, manager of Risk Analytics at Independence Blue Cross (Independence) was honored with the Veterans of Influence Award at a November 1 event hosted by the Philadelphia Business Journal. The Veterans of Influence Award recognizes veterans in the community who have served their country with honor and are now making a difference in business…. 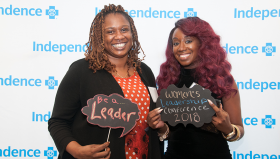 Independence associates enjoy the photo booth at the third annual Women of Independence Leadership Conference. Independence associates participate in an annual day of service to honor the legacy of Dr. Martin Luther King, Jr. at Girard College. 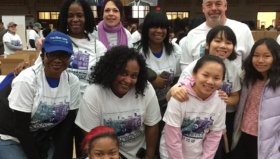 Independence Blue Cross (Independence) associates dedicated their day off to a number of volunteer efforts throughout the Philadelphia region on Monday, January 15 in honor of Martin Luther King Jr…. 6ABC news anchor Tamala Edwards addresses conference attendees during her keynote. Independence Blue Cross continued the positive, exciting momentum created by the recent Pennsylvania Conference for Women with the company’s second annual Women of Independence Leadership Conference featuring 6ABC news anchor Tamala Edwards, Olympic gold medalist Dominique Dawes, and key leaders from Independence and the community…. Independence Blue Cross associates – as well as associates at Independence subsidiaries and affiliates – continue to step up and meet the challenge facing victims living in areas hit hardest by the latest round of hurricanes. 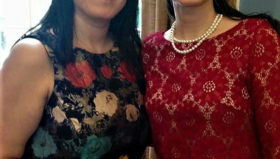 (Pictured L-R) Independence Blue Cross Senior Community Affairs Specialist Yasseline Diaz and Isaac A. Sheppard Elementary School Principal Marisol Rivera Rodriguez. PHILADELPHIA — Independence Health Group, Inc., (Independence) the parent company of Independence Blue Cross, LLC, experienced continued year-over-year topline financial growth for 2016, reporting record total revenue of $16.7 billion, an increase of 21 percent, and net income of $67 million, or 0.4 percent of total revenue….